The backdrop for this Vonnegut quote was created by scanning the back cover of a 1970s edition of Heidi. The site that posted it, Lollipops and Roses, is fun and well worth a visit if you like “vintage curiosities, pretty dresses, and honey bees.” And who doesn’t? Visit the National World War I Museum in Kansas City, and arrive around 11:00 a.m. on a Saturday. Try to attach yourself to a white-bearded guide named Erik. We spent two hours with Erik; he told us things that weren’t even in the museum, like the story of General Sir John Monash, an Australian officer. Erik choked up a bit when he told us about Monash, whose state funeral in 1931 brought out 250,000 mourners, many of them former soldiers. He pointed out a uniform identical to the one his father had worn upon joining the British Army straight out of college. With Erik we visited the trenches, celebrated Christmas in No Man’s Land, examined a crater that had once been a farmhouse, watched the sinking of the Lusitania, and read x-rays of injured troops. Then the tour ended. Erik blithely said good-bye and hurried off without a backward glance. Some of our original number had already wandered away, but the four of us still in his group had become so attached that we suffered brief separation anxiety. For a moment, we lingered in place as if uncertain how to continue on without him. At last the other couple drifted away, and Ernesto and I checked out some of the exhibits that we hadn’t yet seen. It was several minutes, though, before I could shake the feeling of having been in the trenches, knee-deep in mud and gore. Frankly, these figures look like zombies. And why are they gesturing toward Whittier, when anyone can see that the best quote on the poster is the one at the bottom? 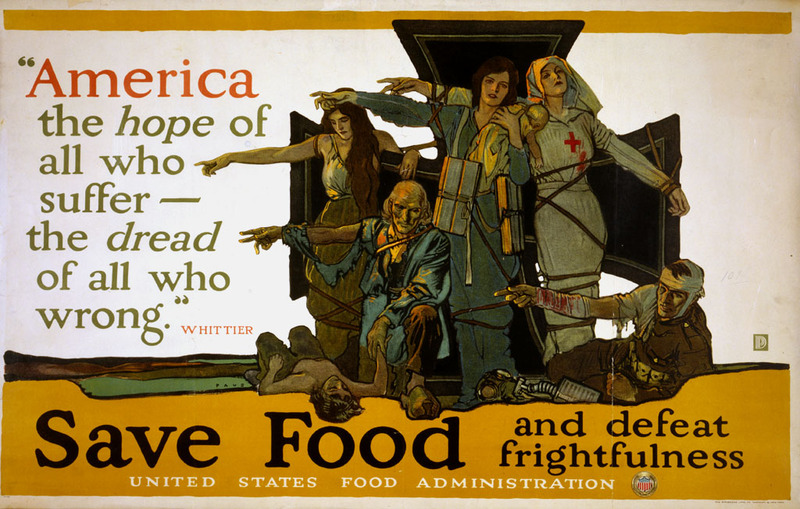 Save food and defeat frightfulness. It sounds like a quote Miss Manners might have contributed to the war effort. Frightfulness seems just one short step up from mild unpleasantness. In fact, frightfulness seems perfectly applicable to the story of some friends of mine who took their 2-year-old out to lunch at a local restaurant. The waitress set Luke up with a fistful of crayons and a placemat to color. Soon one of the crayons hit the floor, and Luke climbed down from his chair to hunt it down and pick it up—just as his mom took a moment to have a quick word with her husband. When she turned back to check on Luke, she found him underneath the table, enjoying a largish chunk of cake that he had found under his chair. Frightful, perhaps, but a nice example of saving food. The daffodils and forsythia are blooming, and trees are frothing with pink or white blossoms so that driving down certain streets is like passing through a birthday cake. I love spring. I like to wander through the yard and check on the progress of the flowers and plants that come back every year. Right now we have peonies emerging, a dozen stalks of asparagus, new growth on the rosebush, and mint freshening and tumbling out of a large pot. The white buds on our apple tree look like popcorn that is nearly ready to burst open. In December, when we were a long way from bloom-time and I was supposed to be buying presents for other people, I found a pretty little book at an antique store: Favorite Plants: Writers and Gardeners on the Plants They Love. Edited by Jamaica Kincaid, the book contains pieces written by a variety of writers and poets. There’s a D. H. Lawrence poem about cyclamens, an essay praising the castor bean by Michael Pollan, and a truly fantastic piece called “A Day on the Edge of the World” by botanist F. Kingdon Ward, who writes about his hunt for new types of tiny alpine flowers. Every spring it loses its fragrance to the earth in one reckless gesture, like a young boy standing at the railing of a ship and saying to his friend—Let us take our coats off and throw them in the sea. In this green menagerie there are colors only bees can see, too slight for human sight. Some tones, like blitz blau and quark bone, can only be observed by ladybugs in the dark. My garden is the universe. I am the universe. I am my garden. All things are the same. 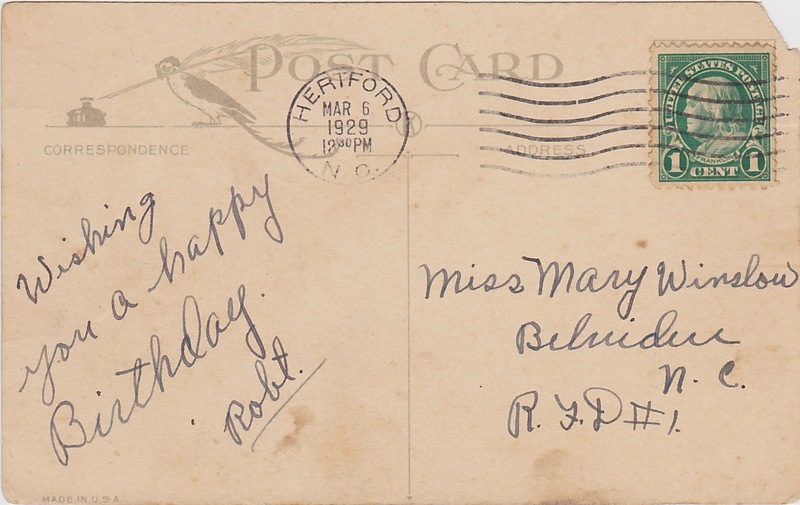 This is the postcard that my grandfather sent to my grandmother on her 19th birthday, 83 years ago today. 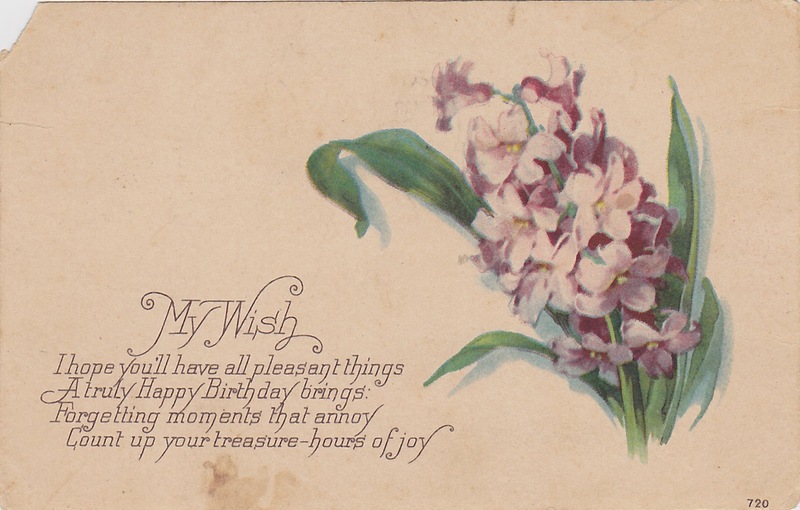 The reverse of the card is shown below. What Can’t a Bunny Do? The North Carolina Museum of Natural Sciences in Raleigh is being picketed, my sister tells me, by an angry citizen. The gentleman who is protesting is perhaps in his early 60s, and he is angry because the museum will not allow him to enter with his service animals. “What in the world type of service animal does he have?” I asked. I listed my first thoughts: Pig, miniature horse, goat, calf? All wrong. My sister had obviously given this matter serious thought. “I believe they improve his spirits,” she said. 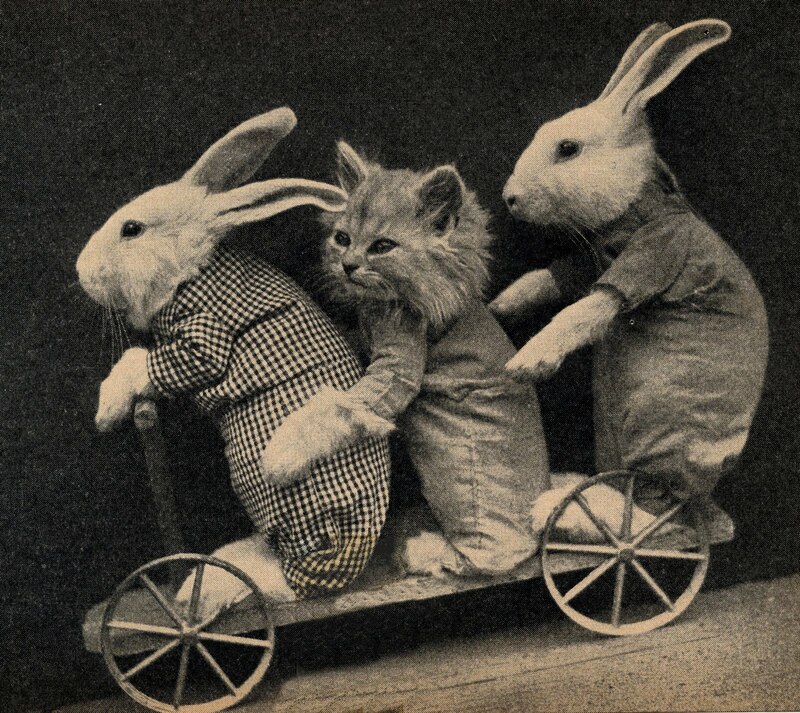 Well, I love the idea of a guy with two bunnies protesting in front of the N.C. Museum of Natural Sciences, and I began to do a little small-scale research into bunnies as service animals. Before I could find anything useful on that subject, though, I came across a Web site called The Comprehensive Bunny Name List™ and with that, my afternoon was shot. Below is a comprehensive list of all known (over 4700) bunny names. If you know of a bunny whose name is not on this list, please contact us…. And please, this is not a list of possible bunny names, so don’t just send a name a bunny might have…. NOTE: Use of this list to obtain names for kitties, puppies, gerbils, hamsters, or other fuzzy pets is an abuse of this service and will not be tolerated. The 4700+ actual bunny names follow; red type indicates a deceased bunny. Every name imaginable is represented: Winslow and Serrano (hurrah), Mustache Pete, Chester Wayne Hotrum, and (a personal favorite of mine) Burroughs Deeply Underhay (deceased). Of course there are classics like Attila the Bun, Jacqueline Bunassis, and Saint Bunny-face the First, but there are also far less obvious names, like Ruth Musser Middle School. What? All of which makes me wonder about the names of the protester’s bunnies. Must service bunnies have serious names, or could they be called Fluffer and Nutter?